I am not really a graphic novel reader. As a kid, my dad would sometimes buy me Archie comics at the grocery store, and I’ve picked up some super hero comics here and there – but that’s about the extent of it. It’s not that I don’t appreciate or admire graphic novels. The artists have a real gift to tell the story through pictures. And the art is gorgeous. It’s just that as a mystery lover, graphic novels have never been a huge draw for me personally. Too many books out there with too little time to read them all. One the appeals of the 2015 Reading Challenge is that it has some categories which definitely challenge me to read outside of my comfort zone. The graphic novel category is one of those. What I didn’t realize was that Fables: Legends in Exile is at heart a mystery. Which (for me) was icing on the cake. The novel begins with Jack (of beanstock fame) rushing into The Woodland Luxury Apartments to see security officer Bigby Wolf (Big Bad Wolf himself, in human form). It seems that Rose Red has met an untimely end – her apartment is covered in blood. The fairy tale characters have been banished from their land (why isn’t exactly clear, I’m assuming there is more info in later installments of the series) and the majority of them live in The Woodland apartment building in New York City. Snow White is the Director of Operations there, second in command to King Cole. She also happens to be Rose Red’s sister. Snow and Bigby team up to find out what happened to Rose. The book was interesting, placing the characters together in New York City. Snow and Bigby’s professional relationship was fun to explore, and the mystery of what happened to Rose Red kept me reading. The novel had a small section discussing why they were living in exile, but it didn’t dive too deep. I’m guessing that this is a topic that is explored more in a later Fables outing. So at the end, while the main mystery was solved, there were still some pieces that left me wondering. As for the OUaT comparison – unlike OUaT, the characters all know who they are and that they have been driven from their homes. In fact, besides the fact that the characters were no longer in their fairy tale realm, I really didn’t feel like Fables and OUaT were that much alike. At all. Overall, a fun (and different) read for me. The graphics were wonderful, and really added to the story. I may even pick up the second volume in the series to see what happens next. Hi! This was the first graphic novel I ever read and it totally hooked me – it was a great place to start. I have since read all of the volumes but one and I adore the whole series. They don’t necessarily maintain the mystery structure but still worth checking out the rest of the series. And I totally I agree – beyond being fairy tale characters in a contemporary setting Fables an OUaT have nothing in common though I love OUaT too. Glad you enjoyed this! I adore Fables! It just gets better and better. I think by the 3rd book, I was completely hooked! 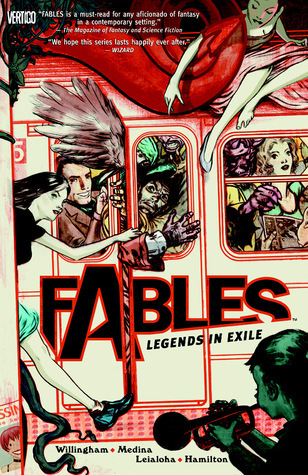 The sellers in comic book stores often recommend Fables to me but I wasn’t sure if I’d like it or not. I am intrigued now though.